Hilary and Mason have a special place in my heart. A couple of years ago when Luke & first were starting out, they trusted me to come take their wedding photos. You can see them here! It was just myself and I had such a great time with this couple. I walked away from their wedding knowing that weddings was where I belonged and they were the type of couple that represented my ideal bride & groom. Fast forward and here they are expecting their first baby! I was so delighted to see them again and capture this amazing moment in their lives. Parenthood is such a privilege and Mason & Hilary are going to be wonderful parents! I met up with them downtown Smithfield on Main Street. We walked the quaint little street and found such lovely spots for pictures. Hilary looks incredible! Pregnancy really does look good on her! We then headed to Windsor Castle where we got some fun shots along the trails and of course the old barn in the background. 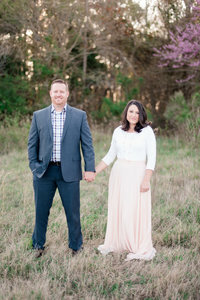 Their style is more rustic and the setting was perfect for them and her sweet baby bump! Thank-You Hilary & Mason for letting me capture this moment in your lives. It is such an incredible honor to be apart of these moments and I am so looking forward to meeting your little one here soon! And as most people know… My kids are usually in tow with me on most of our normal sessions ( NOT WEDDINGS) This session they begged me to bring the dog. And although this will not be a normal occurrence I do have to say he did really well…. Only just a few photo bombs!